All the tissues of the body are made of cells. Every function that occurs in the body is due to the activity of cells. Each cell has a waterproof membrane surrounding and protecting it. Because of ions within the cell that hold an electrical charge, the cell membranes, too, have an electrical charge. A young and healthy cell has a membrane charge of around 70 millivolts. The body’s over-all electromagnetic field is naturally at a higher intensity than all pathogenic cells, including bacterial, viral, cancer, and fungal cells. An aged cell, similarly, has a membrane charge that is lower than a healthy cell. A cancer tumor cell has a charge as low as 15 millivolts. When the membrane charge becomes critically low, the cell has too little energy. In order for the cell to become healthy again, energy must be given to the cell. Charges are also either positive or negative. Healthy cells are negative, and want to be fed by negatively charged ions. On the other hand, all pathogenic cells: viruses, bacteria, yeast, mold, cancer, and all others, are positively charged. The active oxygen molecules that comprise the molecular boundary of the APeX Water nano-cluster have a slight negative charge. As we all know, in spite of oxygen being a gas, and existing in the atmosphere, it also lives happily in water. 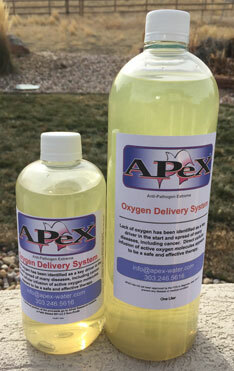 Water is a main carrier of oxygen. Water is one oxygen molecule connected to two hydrogen molecules. If you break the water molecule apart, you have a hydrogen molecule on one side (H+), and an oxygen and hydrogen on the other (OH–). The singular hydrogen (H+) is acidic, with a low pH, and with a positive charge. The hydroxyl (OH–) is alkaline, with a high pH, and with a negative charge. When they, the two “H’s” and the one “O”, then come together, their pH is neutral. The pH of water is 7 (though this changes slightly depending on the quality of the water), and this neutral pH is considered to be the demarcation point between acid and alkaline. The more hydrogen there is in a solution, the more acidic that solution. Acidity can mean a lack of oxygen. 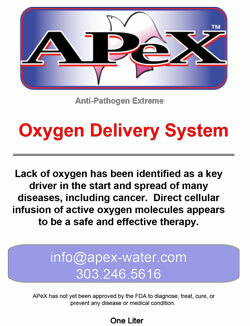 Bacteria, viruses, germs, fungi, and cancer cells all survive with little or no oxygen and all are acidic. On the other hand, usually, though not always, the more oxygen present, the more alkaline is the solution. Alkalinity generally means more oxygen. Our body’s pH will control the activity of every metabolic function happening in our body. pH is behind the body’s electrical system and intracellular activity, as well as effects the way our bodies utilize enzymes, minerals, and vitamins. For more information, and to understand more fully a body’s healthy terrain, see Dr. Jerry Tennant’s video: Healing is Voltage.